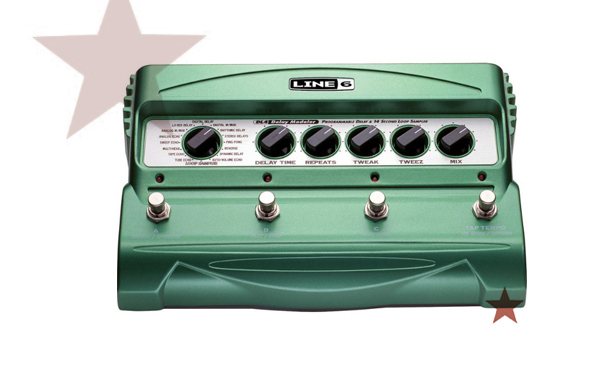 The Line 6 DL4 delay pedal “green box” has become a modern classic in its own right. The DL4 has 16 models based upon celebrated echo and delay boxes from the legendary Echoplex or Deluxe Memory Man to the Roland Space Echo and the T.C.Electronic 2290. This pedal is a rugged and robust delay and effects machine with a tough steel housing that can run for up to 30 hours on batteries (four “C” batteries) or plug into the mains with the PX-2G power supply. The DL4 outputs a true stereo 24-bit signal and also has a 14 second looper on board for creating loops, textures and overdubs. The 1/2 speed and reverse modes will give you mind-blowing backwards guitar solos on the fly whilst the rhythmic and ping-pong delays deliver big panned repeats, echoes and delays from the dirty and psychedelic through to expansive stereo chorus and vibrato sounds. The four footswitches are used to save and recall the sounds you have designed. The range of effects stretches from Edge/U2 style echo through to Hendrix’ Axis Bold as Love sounds. The optional EX-1 expression pedal can morph between two radically different settings for each of your sounds.